The Berkshires and Southern Vermont are hosts to history as well as creativity, and many times these converge into one pure pleasure, offering intimate spaces to encounter music at a close proximity within a setting soaked in that history. That's the case with Kevin's Sports Pub and Restaurant in North Bennington, Vt. The building itself has long been a restaurant and bar, since the early 20th century, going through several iterations of bar and restaurant, and including a couple stints where half the building was either a butcher shop or a post office. Its most recent incarnation has been as Kevin's, renowned for a special intimacy with its musical events. "It's cozy," laughs co-owner Jamie Hill. Hill loved Kevin's so much that he bought it last fall, along with his wife Teddie and their business partner Mike Greene. And he resisted the temptation of so many who take over successful venues by not forcing his own imprint on it. He doesn't want to mess with what is already beloved. One of the hallmarks of Kevin's is a community feeling that draws in repeat visitors to the gathering. 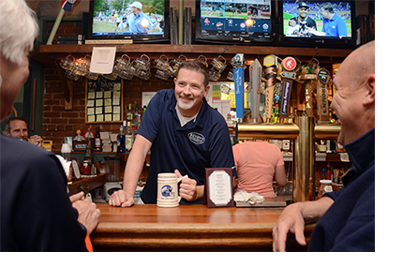 It's a homey, personal atmosphere, with a staff that has populated the place since its opening. That good feeling is helpful, since Kevin's can get pretty packed on any given weekend night. People pour in and take the space to its limits, but the conviviality make the close quarters desirable. "There's no space at all," Hill said. "But there's a lot of people who find the room to dance." The sounds of Kevin's are basic crowd-pleasers - cover bands, mostly, that are as regular as the patrons, forming the kind of rapport that only being regulars can. "Country, '70s, '80s, whatever kind of music you like, they'll sing it," Hill promises.